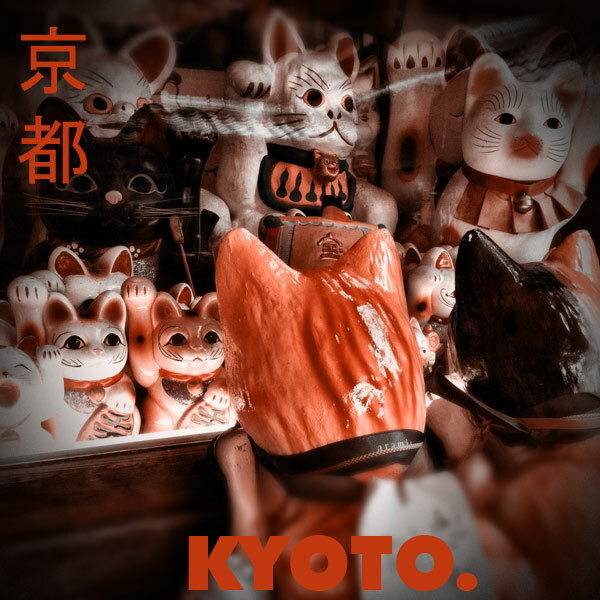 The Neurotic’s Travel Guide to Kyoto, Part 2 | This Japanese Life. There is no ignorance, and no end to ignorance. There is no old age and death, and no end to old age and death. There is no suffering, no cause of suffering, no end to suffering, no path to follow. There is no attainment of wisdom, and no wisdom to attain. The Heart Sutra is 16 sentences (in English) and is said to be the fundamental sutra of Mahayana Buddhism, the devotional branch. It’s one of the few sutras Buddha doesn’t get the credit for. It was written before the Buddha was even born, because Buddhism existed under different names before Buddha summed it all up for us. I spun prayer wheels for the first time at Yasaka shrine in Kyoto. That part of the heart sutra is written on the wheels, which are a horizontal row of bronze coffee-can sized (and shaped) drums on a vertical axis. Spinning a full rotation counts the same, in terms of merit-making, as saying the prayer out loud. Each time you walk around the spinning wheels you amplify their rotations, earning exponential merits. The idea of mechanized prayer is interesting. When I was growing up, an uncle ran a small business, soon bankrupt, where people would lie on chairs that raised their arms up and down. They could take naps, the theory was, but the people would burn calories because they’d be moving their arms about. Didn’t work. Maybe that youthful experience made me skeptical of the prayer wheels. Where is the innovation barrier for prayer efficiency? Why not a conveyor belt inscribed with Sanskrit? Flip a switch and walk away. Earn merit in your sleep! The physical connection is important. It has to be me turning the wheel. I could make a computer program that copied and pasted the Heart Sutra until the end of time, but no one would call it a blessing. But the idea of touching something, exerting effort into spinning it in the name of generating compassion, was nice. We touch things a lot in Buddhism. Touch our hands to the prayer wheels, rub the Bodhai’s belly, hold your hands on the bull statue where our own bodies hurt. You spin the wheel because it’s a new way to think about the heart sutra, which you may have theoretically read out loud thousands of times as a mantra. Kyoto is full of spectacles because the spectacle is how you reinvigorate your faith with a sense of wonder and awe again, take it out of the mundane practice that it really is. It puts a little love in dreams back into the love in action. Exponentials are a common theme in Kyoto. Spin the wheel while walking around the wheel and amplify your karma. At Sanjusangen-do, you can stand in front of one wall and pray to 1001 Buddhas, each one hearing and amplifying your prayer. At the Fushimi-Inari shrine, a series of red Shinto gates lead up the side of a mountain. The gate, usually placed outside of a Shinto shrine, indicates that you are entering a space of awe. 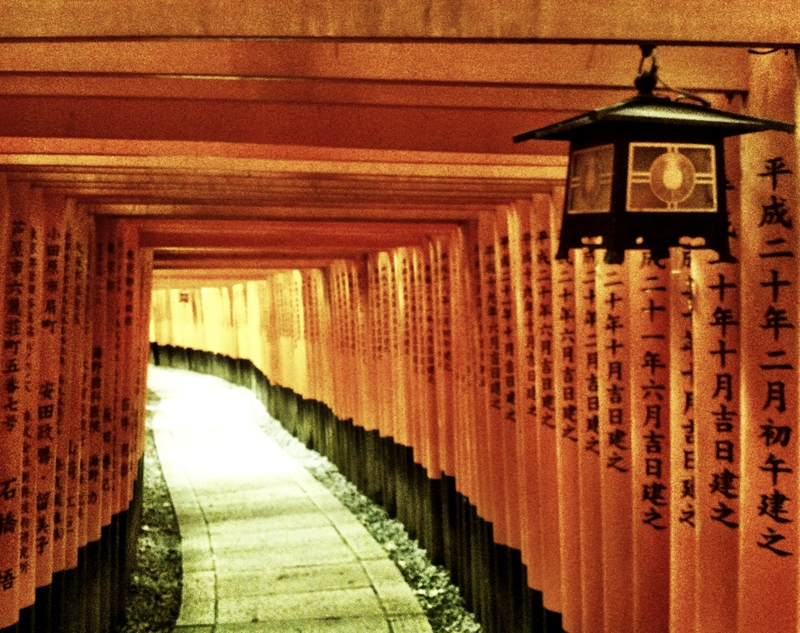 Fushimi-Inari is just a solid stack of fox-colored gates, suggesting an ever-amplified space of awe. The gate to awe within the gate to awe within the gate to awe, etc. The characters written on them, which may seem like mystical wisdom to the kanji-illiterate tourist, are actually “THIS GATE BROUGHT TO YOU BY YODABASHI CAMERA!” identifying the “sponsor” of the gate. No wisdom here, I’m afraid, but the reason for this shrine’s popularity is that it’s a shrine dedicated to wealth. Each gate amplifies awe, but also the chance of getting rich. Yukio Mishima’s novel, “The Temple of the Golden Pavillion,” is a fictional imagining of the life of the real-life schizophrenic monk who burned the original Kinkaku-ji temple to the ground in 1950. Kinkaku-ji is disappointing. You can’t go in, for the obvious reason that a crazy monk burned it to the ground once already. It’s not a 612-year-old building, it’s a 62-year-old replica of 550-year-old building. It’s not even the nicest temple in Kyoto. It does, however, provide English-language fortunes for 50 yen from a bubble-gum machine. I bought one, as I do whenever I see English-language fortunes at shrines. The last time I got one – at Dazaifu Tenmangu – it was the best possible fortune, so my checking in with the bubblegum fates at Kinkaku-ji had an air of greed to it. 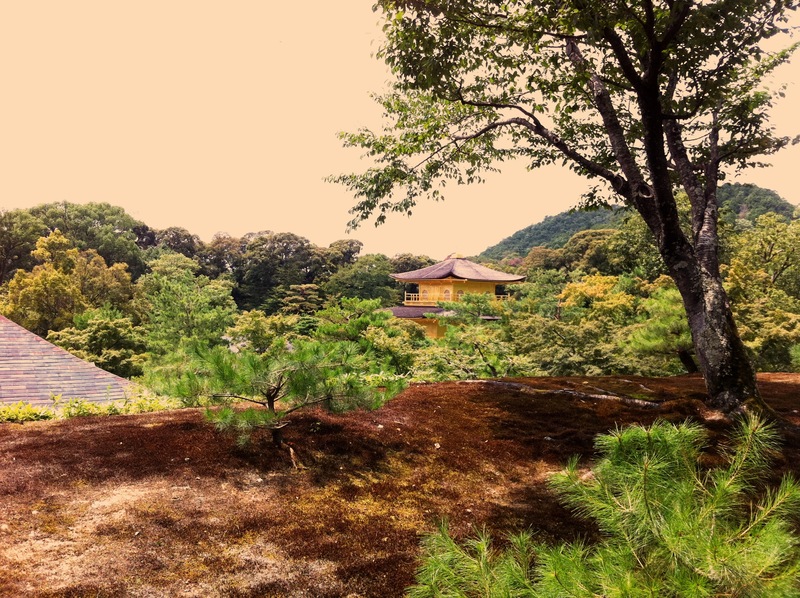 I came to Kinkaku-ji, and Japan, and to everything in life, expecting love-in-dreams, and I’ve been frustrated that it has kept itself obscured and fuzzy, hiding behind the spectacular failures of my love-in-action. The Gods wrote it down on paper, in English, and sent it my way in a gumball machine; “Beware of your ego,” and when I was disappointed that it didn’t have more to tell me, I finally realized it was right. This entry was posted in Shinto, Shrines, Temples and Ruins, Thinking, Zen and tagged Kyoto. Bookmark the permalink. I want to let you know that there’s peoples out there that read and appreciate your writings. I’m one of those. Thank you! Your writing and photography are both amazing. You may find it impossible to believe, but until I read this post I had never once considered prayer efficiency. Thank you. As a fellow solo traveller currently ambling around in Japan, I look forward to all of your posts. Yeah – it was called Hinduism. The word Mahayanam is sanskrit means greater vehicle. The problem is though, Buddhism doesn’t explain why the sutra is the way it is.There is nothing found in Buddhism that isn’t either just lifted directly from Hinduism (and other religions) or rehashed to make it seem like the various Buddha’s had epiphanies. It’s a bogus religion with no explanations of science and physics, where most of the ideology comes from and there is no proper explanation for how it all came about because it had to be distinguished from all the existing religions it stole from over the centuries. Hence a lot of the monks and nuns make no sense when they talk about the Buddhist philosophy and they always have to end up either referring to well respected philosophers from the west or smiling crazily. But in defense of Buddhism, you can not convert to Hinduism and Buddhism made it possible for people to follow a pretty logical and cool philosophy, simplified down for the masses by cutting out huge explanations and the exclusivity that goes a long with Hinduism. There are Buddhists who have made programs which “spin” mantras on their computers, because the hard drive (for those without an ssd) turns the same way that prayer wheels are supposed to be spun!